Claddagh rings are an old, Irish designed ring attributed to Richard Joyce, a Galway goldsmith, whose 1700 ring is the oldest in existence. The word 'Claddagh' is sometimes misspelled as Claddaugh, Cladaugh, Claddah, Cladah or even Clada ring. 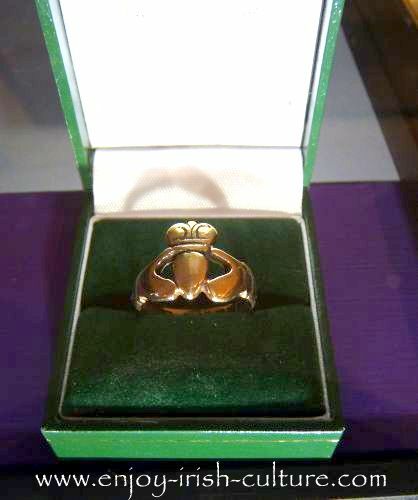 Antique version of the traditional Galway ring at the ring museum on Quay Street, Galway. Johnathan Margetts is the proprietor of the oldest Claddagh Ring company in Ireland, T.Dillon and Sons who have been making these rings since 1750. T. Dillon and Sons is now the oldest Irish jewellers in existence. 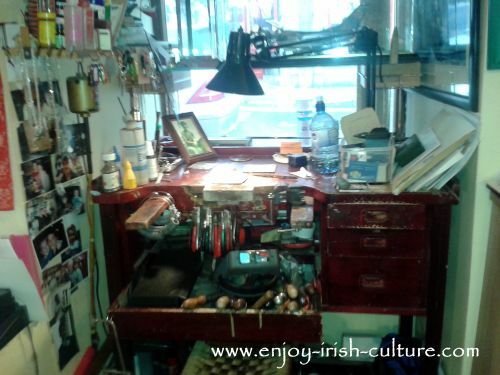 At the back of his shop in Quay Street in Galway, Jonathan has a small museum open to the general public for free during the shops' opening hours. In this interview, Susanna talks to Jonathan about the museum which contains, among other things, a lot of antique Claddagh rings, like the 1964 T. Dillon and Sons ring shown below. Jonathan, how did the museum in your shop come about? When I took over the family business, I had to find new premises. I eventually found them on Quay Street and the shop has been located there since 1992. The place is a lot bigger than the previous shop, and it has two rooms. At first, I didn’t really know what to do with the second room. Should I have two shop areas? One concern was that we didn’t have a lot of money to invest in buying in stock or expensive shop units. Then I remembered that our family had a good few antiques and other items relating to the Claddagh ring. The museum is located in the back room, the front room is the shop. The shop doubles as a workshop where Jonathan will make adjustments on the rings for customers like polishing and resizing. He offers lifetime aftercare. When my grandfather bought the business from Thomas Dillon in 1920, the premises came with everything included. At the time, a lot of people were emigrating, and when they were short a few bob they traded in their rings. 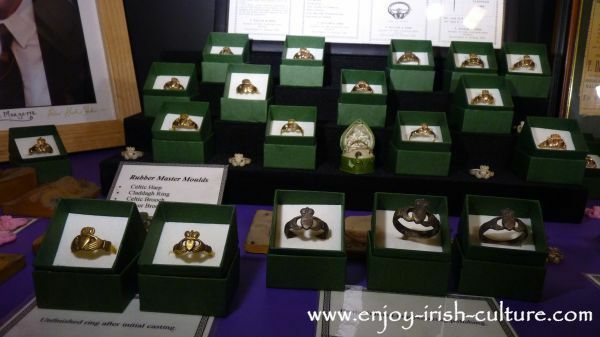 So my grandfather now owned about 8 of these really old Claddagh rings shown on the photo below. He also had a collection of other antique bits and bobs. My grandfather used to be a bit of a magpie collecting these things. As well as those family heirlooms, we had all the old moulds that we had used making rings over the years. These rings, you see, are made by casting. Then there was old correspondence relating to my dad’s commissions. 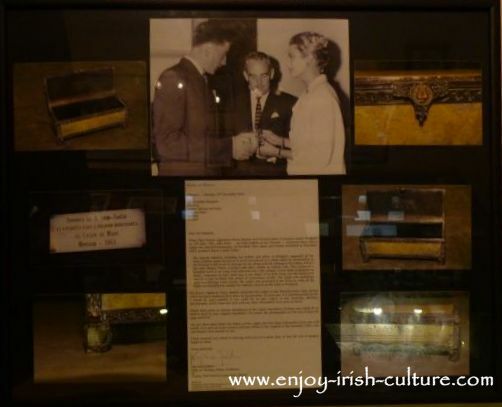 My dad had made a bejewelled casket from silver and Connemara marble for Princess Grace. The casket contained a piece of vellum in scripted with the family tree that my dad had also made. Actually, I got to see the casket (shown on the photo above) a couple of years ago when we travelled to Monaco. We got Royal treatment there! 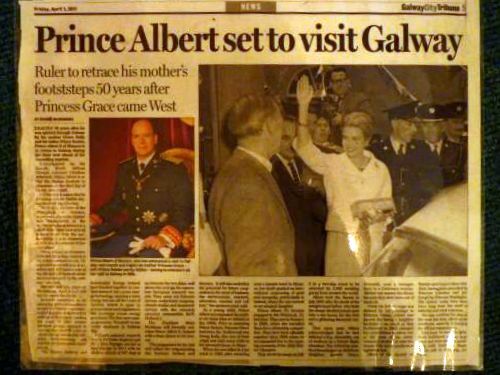 So, there was all this correspondence with Prince Albert and newspaper cuttings shown below. Also, when President Kennedy visited Ireland, my dad was commissioned to make a miniature copy of the Galway Mace, which is now kept at the JFK Library. There was correspondence about that, too. So when I really thought about it, I realized that there were quite a few items of historic value, from the point of view of the family business, but also of interest to tourists and customers at the shop. The idea grew on me and we went for it. But, as I said, we didn’t have a lot of money that we could invest in the shop or the museum. Everything was done very simply. Yet, people love it and we get a lot of positive feedback. Come by and visit when you are in Galway. The museum is open during shop opening hours, and it’s free. Hi there, hope you liked our page on the traditional Galway rings. If you like what we do on this website, how about spreading the word? Please give a social call out to all your friends using the options provided at the top left or at thebottom. Thanks a million! Warmest reagrds from Colm and Susanna. Return to the start page of this section.